‘AlIEN SHE is the first exhibition to examine the lasting impact of Riot Grrrl, a pioneering punk feminist movement that emerged in the early 1990s in reaction to pervasive and violent sexism, racism, and homophobia in the punk music scene and in the culture at large. Emphasizing female and youth empowerment, collaborative organization, creative resistance, and DIY ethics, Riot Grrrl helped a new generation to become active feminists and create their own culture and communities that reflect their values and experiences, in contrast to mainstream conventions and expectations. This exhibition focuses on seven people whose visual art practices were informed by their contact with Riot Grrrl, in addition to a historical section sampling the movement’s vast creative output through hundreds of self-published zines, hand-designed posters, musical playlists representing different Riot Grrrl scenes internationally, video interviews, and more. 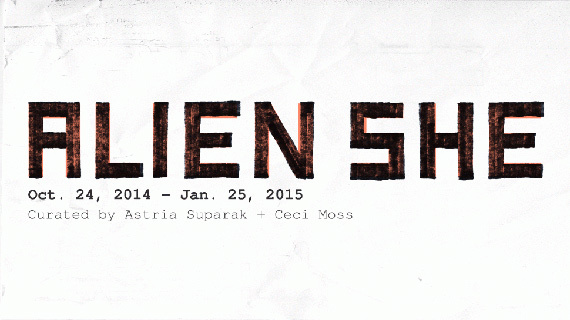 ALIEN SHE is curated by Astria Suparak and Ceci Moss, and organized by the Miller Gallery at Carnegie Mellon University.